Unwrap a luxury wee lodge with hot tub, this Christmas! As a special present to those who have stayed with us on the riverbank before, we offer an exclusive voucher. 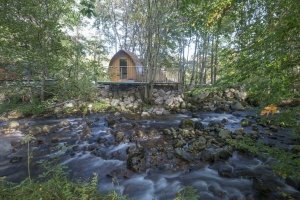 For just £299, the voucher entitles the bearer to TWO NIGHTS LUXURY WEE LODGE WITH HOT TUB, on any two consecutive nights, at any time of year. This represents over 50% off our normal season rate! To purchase a voucher, please click here. The stylish voucher is presented in a special, hand crafted folder, within an envelope. This envelope is put inside another envelope, which is posted to the address you provide during the shopping cart process. To redeem the voucher, the recipient simply calls us with the dates required for the stay, and the voucher reference. It’s a good idea to check availability first, via our on-line calendar on the main bookings page of the RiverBeds web site.